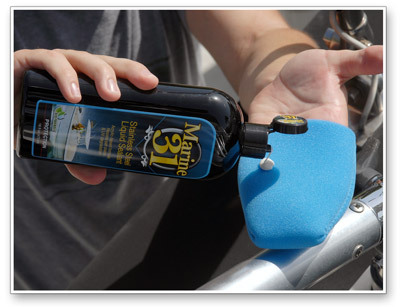 Home > OUTLET STORE > Marine 31 Stainless Steel Liquid Sealant 32 oz. Marine 31 Stainless Steel Liquid Sealant is comprised of a water-based formula that features a metal-specific acrylic polymer sealant. This special polymer is designed to form a durable, cross-linking bond to stainless steel, aluminum and chrome surfaces, protecting them from the elements that a boat is exposed to, both on land and water. Metal surfaces that are treated with Marine 31 Stainless Steel Liquid Sealant will retain a brilliant, mirror-finish. Marine 31 Stainless Steel Liquid Sealant is cheap insurance for protecting your boat’s stainless steel, aluminum and chrome surfaces. Stainless steel is typically difficult to polish, aluminum naturally oxidizes and chrome is very expensive to replace, all the more reason to protect your boat’s metal surfaces with Marine 31 Stainless Steel Liquid Sealant! It’s only an added bonus that Marine 31 Stainless Steel Liquid Sealant is incredibly easy to apply and remove. Marine 31 Stainless Steel Liquid Sealant imparts a durable, clear protective coating that withstands the elements for up to 6 months. Water will bead up and roll off and removing bird droppings will be effortless. What’s more, treated metal surfaces will remain noticeably cleaner in between washes. What more could you ask for in a boat metal sealant? 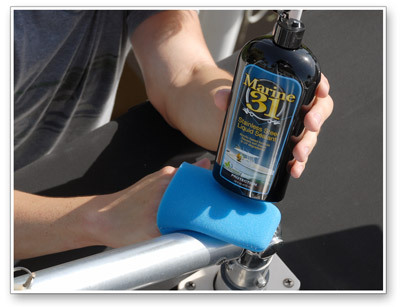 Marine 31 Stainless Steel Liquid Sealant is harbor-safe and eco-friendly. If surface is dull, oxidized or stained, first polish it with Marine 31 Stainless Steel Liquid Polish. Apply a dime-sized amount of product directly onto a clean, dry foam applicator. Apply a thin, even coat and allow to dry for 5 minutes. Apply an additional coat to ensure even coverage.